The goal of any restaurant critic should be to offer a relatively educated opinion about a dining experience to the public. In the day and age of smart phones, Yelp, food blogs, and online magazines, getting someone’s two cents isn’t necessarily even that valuable. One of the things that is missing in most critiques is context. Many factors go into someone’s opinion about a restaurant experience. For example, my father once complained that the pork chops at TGI Friday’s were too juicy…too juicy…is that even a thing? My husband, on the other hand, is willing to tough out a new experience with me. His only criterion is that he doesn’t leave hungry and for him that means a meal on a plate. Then there are the children. My poor children aren’t allowed to simply not like something. It is a lengthy conversation involving a barrage of questions about what they didn’t like. Was it the texture, was it too bitter, sweet, salty, what…what! These are not the people you want getting a bee in their bonnet and writing a review. I was a restaurant manager before my children were born. Having a degree in Hospitality Management and Culinary Arts is like having a PHD in other fields. There are few other occupations in which qualifications come as easily. Because someone likes to eat and drink and has seed money, he or she somehow has all the qualifications needed to run a restaurant. I have great respect for chefs and restaurant/bar owners, but you really have to love the business. I can tell when I walk in the door whether or not they do. Recently, I walked into a local spot known for creative hot dogs and sandwiches. It also offers breakfast, lunch, dinner, and (my favorite) online ordering for takeout. Some of the local “Best of’s” were just published and River Dog Café won in one category and was a contender in some others. On entering River Dog Café, I was greeted by a person who seemed genuinely happy to be there. I asked for recommendations, ordered a Jenny Dog- hot dog with bacon, brie, and honey truffle glaze ($6), The Adam Bomb-hot dog with beef brisket, creamy cheddar cheese, and fresh herbs ($6), a side of macaroni and cheese ($4), and tater tots ($2.50). I ordered it to go so that I could dissect it at home and share with my boys. The menu notes that all hot dogs are grass-fed, Angus beef, and uncured, free from nitrates. I thought all the bad stuff is what makes hot dogs taste good, but this one proved me wrong. The River Dog also offers a veggie version or kielbasa and bratwurst option for dog suggestions and builds dogs. The Jenny Dog was excellent. The brie and the bacon along with the honey glaze had a bite but made for a savory sweet combo. My younger son taste of only the brie. It was a little too sharp him but he said the rest was darn tasty. The buns are soft but sturdy, so even with all the toppings, you don’t end up with a soggy dog. The Adam Bomb was good too, although it seemed to need some crunch. Of course, my sons fought over the last bit of cheese sauce for their tater tots. The macaroni and cheese was a perfect meld between kid and adult flavor palettes. The flavor proves it is house made. It was cheesy but not dry and wasn’t, as my son says “too saucy”. He loved the corkscrew pasta. Bar 145 in Avon has excellent mac and cheese. River Dog could rival it at half the price…and with better service. Later that evening, we ordered online, which was quick and easy. We tried a Crispy Duck BLT ($9.50) duck breast, bacon, brie, lettuce and tomato, cherry mayo on a grilled ciabatta. The cherry mayo mixed with the brie made for a wonderful creaminess next to the crunch of the bacon. The only flaw was that the skin of the duck was not crispy. It is clear that quality ingredients and thoughtful components go into each of the items on River Dog’s menu. The café is owned and operated by Christian and Jennifer Barnes, residents of Rocky River. The family’s passion for good food is evident in everything made. I look forward to trying the Sunday brunch and what has been described as “the best cinnamon roll you’ll ever have”. 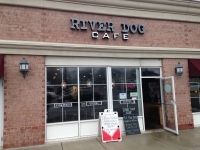 The River Dog Café is located at 19900 Detroit Ave, Rocky River; phone, 216-767-5559. Visit the Café at riverdogcafe.com, Facebook, and Twitter. Colleen Wing has a degree in Hospitality Management and Culinary Arts. She and her family live in Rocky River. Colleen believes that life is too short to waste good calories on bad food and wine.